Michael Garcia wants to fly jets after he finishes playing baseball and graduates from the U.S. Naval Academy. Michael Garcia played football, basketball and baseball for the Kalaheo Mustangs and was ready to move on to something bigger and more challenging and perhaps more exciting after graduating in 2002. "Initially, I wanted to fly jet fighters," said the starting third baseman for the U.S. Naval Academy baseball team. Garcia considered walking on at Hawaii to play football, had an offer to play that sport at Linfield, thought about Nebraska, but his mother, Linn, suggested either the Air Force or Naval academies if he wanted to pursue his goal. "I had a couple of friends at the Naval Academy and they really like it," said Garcia, who did not visit any mainland campuses before deciding on Navy. At the suggestion of Naval Academy advisors, who felt he should get his academics up to standard, Garcia spent a year at the Naval Academy Preparatory School in Newport, R.I. There he had to decide whether to play football or baseball and chose the diamond. It was there that former Navy coach Steve Whitmyer saw Garcia practicing and encouraged him to try out for the Midshipmen. He made the team but played in just seven games as a freshman and 26 as a backup catcher his sophomore season. "You get in that mode where you are not playing, a lull where you don't know what to do. You try to get better and when you get your shot, you try to make the most of it," Garcia said. His shot came last year after Paul Kostacopoulos took over as head coach. "My first impression was that Michael is a very hard worker. That immediately stood out after a few days of practice. You don't have to look too hard to find players like that," Kostacopoulos said. "Mike loves to play, has a great deal of passion for the game. He was a part-timer the first half of the year, but every time he went in, he did the job. It became evident that we had to have him in there." Kalaheo graduate Michael Garcia tops Navy in batting average (.346) and on-base percentage (.435). The 5-foot-11 190-pounder became the regular third baseman midway through his junior season, although Kostacopoulos has played him at second and first when a lineup shuffle is necessary. Garcia finished with a .323 batting average while hitting primarily in either the No. 2 or No. 6 spot in the lineup. "Mike can do a lot of different things. You can fill him in where you need to. 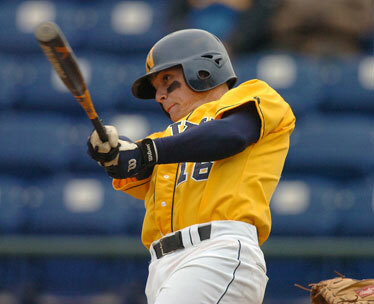 Almost everything he does on the baseball field, he does pretty well," Kostacopoulos said of the team captain. "He can handle the bat, bunt and moved runners up as the No. 2 hitter. He is a tough out. I put him at No. 5 or 6 because he is a pretty good clutch hitter and can clean up for the top of the order." Garcia describes himself as a scrappy hitter who sprays the ball to all fields. "I choke up, especially with two strikes, and put the ball in play. I hate to think of myself as striking out. I just want to put the ball in play," he said. He definitely felt good beginning his final season of baseball for the Midshipman. "Coach makes sure we don't take anything for granted. He is the first guy to let you know if you are not hustling," Garcia said. He couldn't have had a better start than his 4-for-4, two walks and two-runs-batted-in performance on opening day in a 12-3 victory over Florida A&M on Feb. 9. "That was a big accomplishment for me," Garcia said. "The opportunity to play Division I baseball is unbelievable, my favorite highlight." Despite playing all the infield positions during his college career, Garcia does not have a favorite position. "As long as I am in the lineup and hitting, it doesn't make any difference," he said. 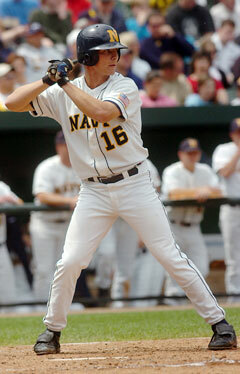 He leads Navy with a .346 batting average and .435 on-base percentage. Garcia is second in at-bats (153), runs (36), hits (53) and walks (19). Garcia, who is majoring in quantitative economics, will graduate May 25, then report to Naval Air Station Pensacola in Florida for flight training. "I was introduced to flying for a couple of weeks during the summer before my junior year. We flew in a couple different planes and actually got to fly the plane. We also spent time in flight simulators," said Garcia, who will be at Pensacola for two and a half years. "I want to fly jets but I won't be disappointed with what ever they give me." "Mike is a credit to the whole state. He represents Hawaii in an extremely positive manner," Kostacopoulos said. Notes: Garcia was on the Commandant's List in the fall of 2003 and the spring of 2006. ... He was a backup forward to Ikaika Alama-Francis on Kalaheo's 2001 state championship basketball team and a starter at small forward on the 2002 state runner-up team. ... Garcia played both infield and outfield for the Mustangs, did some catching and pitched quite a bit his senior season. » Starwood's overseas growth offsets soft demand in U.S.